The serial entrepreneur will be hoping to avoid the kinds of problems that faced Lastminute.com. Last year started with a flurrry of IPOs but ended with an number of high-profile cancellations, including those of Fat Face and Aldermore Bank, thanks to a bout of market turbulence. Those who put back their listings will be figuring out when best to give it another go, and with the general election around the corner they could be tempted to go for it in the next couple of months. One company mulling its options is online furniture retailer Made.com, which hasn’t officially confirmed plans to float, but appears to have been considering it for some time. Rumours of a stock market debut have been doing the rounds since last spring, when a raft of online companies including Just Eat, Zoopla and AO World all floated. Today the Telegraph reports that advisors to the company, which employs 160 people, have been testing demand for a £100m float that would raise around £50m in new cash. The company was founded by serial entrepreneur Brent Hoberman, one of his previous employees Chloe Macintosh and French investors Ning Li and Julien Callede in 2010. It aims to cut out the middle man in bespoke furniture retail, offering knock-down prices on high-end chairs, tables and lamps. Hoberman, Made's chairman, has previous experience of floating a business. Along with Martha Lane Fox he was a co-founder of Lastminute.com, which went public in March 2000 and has come to be one of the most commonly cited British survivors of the dotcom crash. Its float price was 380p and shares rallied to 511p on the first day, valuing the company at £768m at the dawn of the millenium. But by mid-April they had fallen to 30% of their original value. They continued to decline throughout most of the Lastminute.com’s life as a public company before it was bought by Sabre Corporation in 2005 for just 165p per share. 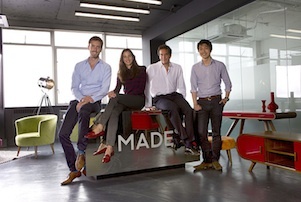 If Made's IPO does go ahead, Hoberman will be hoping that this time things will be different.